Nairn,Sir David: payment to, [by Commission ers of Musters ofthe Army in Scotland ]for agency, 27.
royal bounty for, 25, 164. Secretary to the Order of the Thistle, allowance and salary, 20, 153, 539; warrant countersigned by, 135. Najac, Anthony, captain in Lord Ashburnham's horse, half pay for, 478. Nance, William, tidesman in Falmouth port, promotion for, 294. Nantes, France, ship of, 138. Napper, William, lieutenant in Hyndford's regiment, half pay for, 476. Narbonne, John, payment to, in South Sea Stock and tallies, 248. Nartloe, Henry (Henry Nart Loe), Groom of the Bake house, Royal Household, 495. Nash, Julian, appointed water man at Gravesend, 283. -, Samuel,PSage of the Backstairs to George, Prince of Denmark, instruction in business of the Customs for, 100; pensioner on the Civil List, 540; petition of, 100. Nasmith, Barbara, removed from list of Royal bounties in Scotland, 322. -, James, under falconer in Scotland, superseded, 450. Natt, Count van der. See Dernath, Gerhard. Naturalization, General, Act for [7 Anne, c. 55, repealed by Act 10 Anne, c. 9], 454, 527. Nausas, John Las, major of foot, petitioner, 410.
bought by captains in North America, account of, 150.
contract for supplying money to captains for buying, 60.
old, sale of, money arising from, allowance to the First Commissioner of the Admiralty paid out of, 3; issues out of, 38, 69, 84, 227, 257.
scheme for supplying, from North America, 158. Navigation Act, ship seized under, 374.
abuses and frauds in, 360, 406,f 408.
accounts and estimates for, required by the House of Commons, 184.
beer for, delivered short, 426. Bills, 69, 77, 84, 94, 112, 133, 146, 158, 173, 178, 185,193, 212, 220, 227, 240, 257,277, 282, 296, 306, 313, 316,323 (2), 336,379, 381, 408, 428, 441, 459, 462.
bills of exchange (foreign), issues and Payments for,11, 32, 38, 49 (2), 116, 202, 222, 257, 282, 355(2), 470. 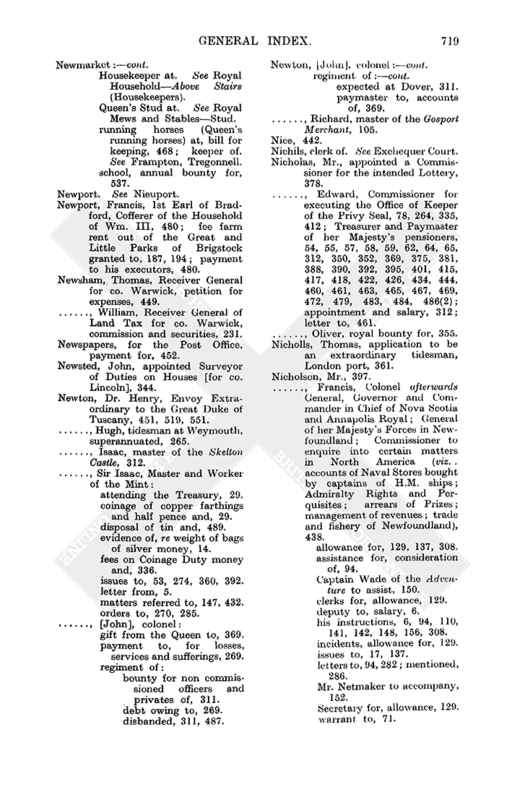 Chest at Chatham, one years pay (pensions) in, advertised in the Gazette, 53; issues for, 446.
commanders. See Navy Officers (captains). 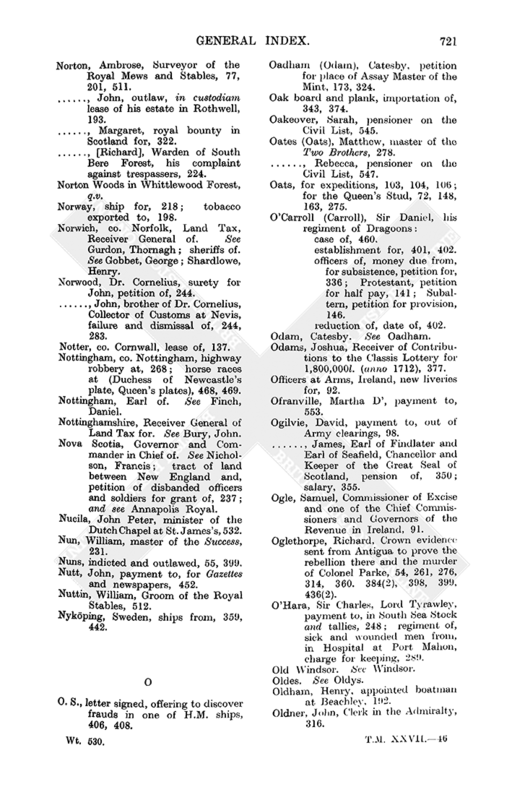 Commissioners(Board): appointed Commissioners to enquire into damages sustained by proprietors of lands purchasedfor fortifications at Ports mouth,Harwich and Chatham, 394.
attending the Treasury, 60, 410, 432.
directed to proceed in stating accounts of Naval Stores bought in North America, 150.
letters to and matters referred to, 52, 60, 69, 77, 84, 85, 93, 96, 69, 112, 136(2), 146, 150, 158,173, 175, 177, 178, 193, 209, 212, 217, 223, 227, 240, 250, 257, 296, 306, 313, 316, 323, 336, 339, 362, 367, 368, 379, 388(2), 390, 397, 405, 406, 408 (2), 409, 410, 412, 428, 429, 441, 448, 456, 462.
reports by, 11, 60, 214, 220,	227, 340, 410.
warrants to, 133, 158, 214, 277, 340, 410. Book of Wages four months, issue for, 12.
new, issues for. 6, 49, 59, 63, 91, 116, 160, 183, 202, 251, 313, 355(2), 367, 407, 431, 449, 451, 470.
old, issues for, 32, 185,459.
creditors of, South Sea Stock transferred to, 336.
debentures, owners of, admitted as shareholders in the South Sea Company, 47 note; sub scribed in to South Sea Stock, 330.
debts of, Commissioners for stating (appointed by Act 11 Wm. 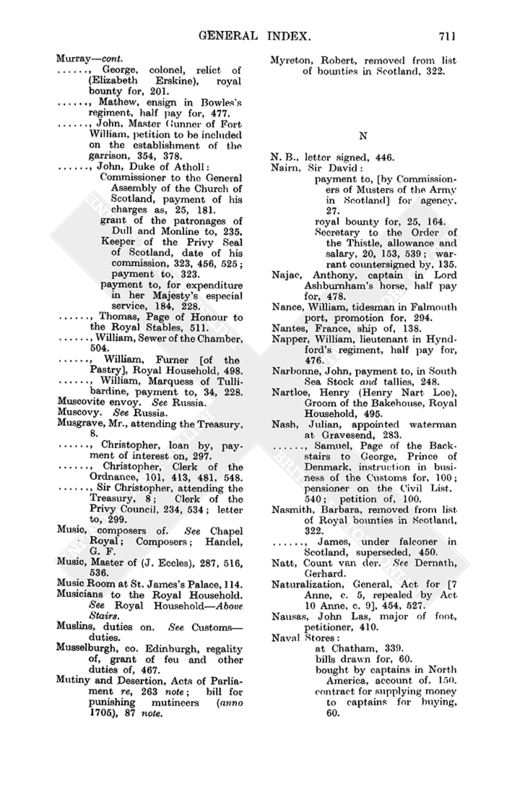 III, c.8), 46 note; payment of, 96,153.
lease of ground for, 125.
pay of, issues for, 49, 355, 356, 386, 407;memorial for, 407.
workmen discharged from, 11, 99. See alsoChatham; Dept fordmast dock; Ply mouth; Portsmouth. gun money, petition for, 237.
contract price of, abate ment of, 339, 340, 368, 410.
contractors for (Arthur Ralph Robinson, Sir G. Webster, Sir T. Webster), 388, 410;extension of time for delivery by 209, 214, 339, 367, 368, warrant for, 340.
hospital ships. See. Navy ships. imprests for, uncleared, account of, required, 175.
iron for, importation of, 277.
issues for, 33, 37, 46, 178, 274; and see NavyTreasurer. labourers, pay of, issue for, 407.
lands purchased for the service of, 417.
loans for. See under Navy Treasurer. discharged, wives and families of, petition of, 250.
bills drawn by, 136, 373, 412.
half pay, issue for, 367.
stores bought by or supplied to, 60; in North America, 150. Flag, pay of, issue for, 32, 367.
superannuated, petition for their allowances, 421.
who have passed their accounts, issues to, 32, 202, 222, 257, 281, 386, 407.
ordinary, issues to head of, 407, 441; Parliamentary supply for (anno 1713), estimate for, required, 14, 134. Parliamentary supply for (anno 1712), issues out of, completed, 2.
pilots, issues for, 12, 126, 367.
pressing occassions of, loan for, 40.
pursers, 448; beer delivered short to, 426; necessary money for, issues for, 49, 355.
discharged (paid off, reduced), account of, required, 398; issues for, 3, 46,79, 325, 345.
short allowance money for, 121.
sick and wounded. See Sick and Wounded. wages of, arrears of, anonymous information re, 136; collection of duty of 6 pence per month out of, 156; petition for, 413.See alsoNavy Wages. 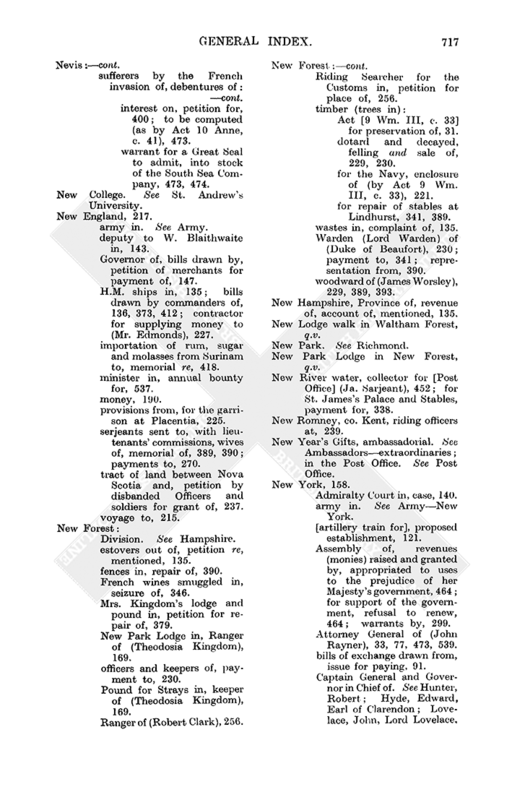 wives of, petition of, 413; very clamorous for wages, 362.
ships (squadrons): at New England and New York, 227.
at the out ports, short allowance money for, 355.
bedding received from, for expeditions, 103.
captains and commanders of. See Navy Officers. compliments (companies) of, reduction of (put out of pay), 51, 312, 325; to middle compliment, 2, 3, 79, 128.
contractor for supplying money to, at New York, Eng land and New York, 227.
for the Assiento trade, 376.
for the Baltic, reduced men of, 46, 345.
for preventing the exporta tion of wool, 488.
fourth rate, carpenter of, 51.
frauds in, anonymous information of, 406, 408.
from New England and New York, 136, 373, 412.
from Turkey, short allowance money for, 49, 355.
in France, visiting of, by Customs officers, 238, 284.
in the Mediterranean, 121; short allowance money for, 82, 85.
in the West Indies, commander of (Sir Hovenden Walker), complaints against, 85.
laying up. See below paying off. 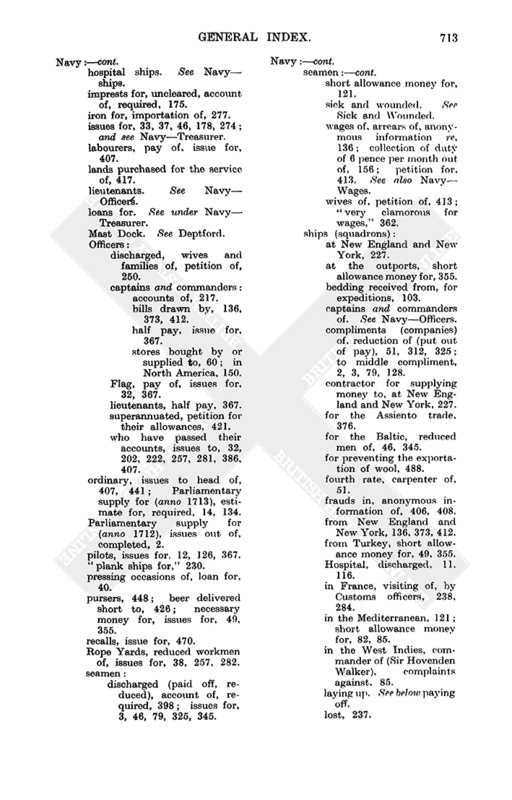 on foreign voyages, issue for wages of, 335.
paying off and laying up, issue for,2, 7(2), 30, 32(2), 49, 51(2),59,91(2),109(2),202(2), 216, 222, 230, 242, 251, 281,355, 376, 398, 407, 431,;short alowance money for,213, 251, 376.
proclamations for encourag ing seamen and landsmen to join, 328, 329(2). short allowance money, issues for,13, 49, 51, 82, 85, 121, 126, 251, 355, 376;and see NavyVictualling. South Sea Stock for. SeeNavy Treasurer. timber for, enclosures for, in the New Forest (by Act 9Wm. III, c. 33),221; trees in Windsor Forest not fit for, warrant to fell,272. Treasurer of(Charles Cser). SeealsoLittleton, Sir Thomas accounts of, 429; privy seal for passing, 59,434.
attending the Bank of England,40,61. attending the Treasury.1, 20, 38, 46, 56,59, 61, 63. Customs officer recommend ed by, 306.
his proportion ofParli mentary supply for 1712 completed,2. imprest to, privy seal for, 274.
interest on Exchequer Bills and, 320.
issues to. 2, 3, 6, 10,46, 54,56, 59, 69, 77, 84, 112, 200,202, 213, 216, 222, 224, 230, 235, 242, 251, 257, 258, 262, 263, 310, 346, 386, 441, 451.
letters to and matters referred to, 3, 6, 57, 79, 109, 110, 112, 113, 146, 150, 160, 183, 290, 320, 325, 335, 345, 376, 379 (2), 386, 408, 427, 446.
interest on, account of, 386; issues for payment of, 11,61, 116, 296, 297, 386, 408.
security for, 6,38, 40, 61, 277.
by Sir R. Hoare, et al., 296, 297.
interest on, issue for payment of, 296, 297.
on Malt tallies (anno 1713), 40, 46, 61, 277, 296, 306, 312, 346, 462, 470.
o n South Sea Stock, 6, 7, 10, 11,59, 73, 78, 91, 92, 94, 116, 126, 146, 160, 297, 303, 367, 376, 386, 407;intereston, 73,	297, 303; not tobe applied but as the Lord Treasurer shall direct, 110.
memorials by, 11, 29, 32(2) 36, 38, 46, 49, 51, 56, 59, 61, 63, 407, 429, (2) 449, 471.
money imprested by, to Walter Whitfield, 112. Navy bills on, 379, 381.
payments by, 11, 12, 38, 72(2), 79, 91, 93, 94, 96, 109, 112(2), 116, 146, 160, 178, 183, 185, 202,213,222,224,230,235,242, 251, 257, 258, 271, 281, 296, 312, 325,335,336,345,355,356, 335, 336, 345, 355 356, 367, 375, 376,379, 386, 407, 408, 431, 441, 451, 462, 470. South Sea Stock subscribed by him for the public (in his hands), 32, 96.
amount of, 347; certificate of, 149.
application of, 1, 65, 109, 186.
dividends on, 148, 149, 173, 183, 349.
g	reat seal re, 153.
mortgaged, account of sums raised on, required, 145.
transfer or assignment of, 3, 10, 20, 46, 76, 78, 79, 109, 137, 157, 163, 175, 176, 185, 191, 207, 212, 229, 237, 256, 318, 352, 353, 368, 369, 430, 459, 479. account of required, distinguishing absolute from redeemable transfers, 145, redemption of, 213.
tallies and orders assigned or deposited by, 6, 200, 213.
warrants to, 72, 73, 92, 185, 193, 303, 318, 346, 375, 479. 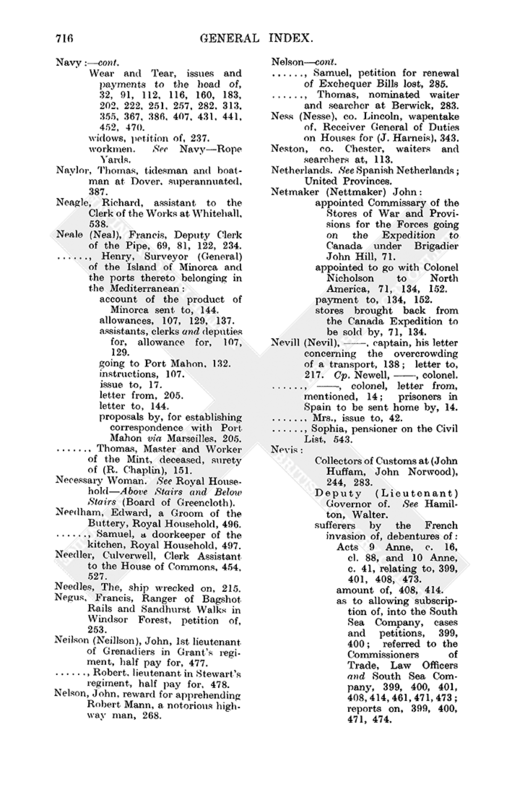 Victualling: agent for (Agent Victualler) at Gibraltar, 291, 371.
bills of exchange (inland and foreign), issues for, 30, 65, 109, 213, 472, 479; memorial re, 471.
brewers contracting with, beer delievered shorts by, 426. 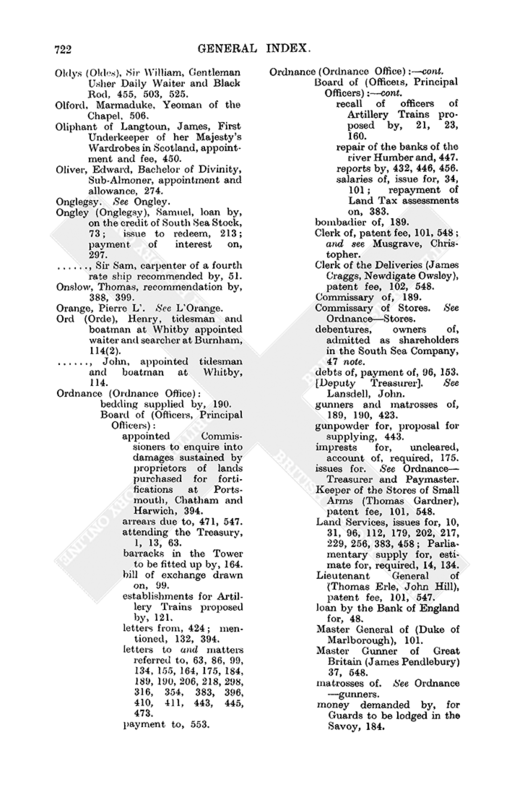 Commissioners: appointed Commissioners to enquire into damages sus tained by the proprietors of lands purchased for fortifications at Portsmouth, Harwich and chatham, 394.
attending the Treasury (Lord Treasurer), 25, 61, 442, 472.
bills of (Victualling Office bills), 76, 472; warrant to make out, 168.
letters to and matters referred to, 82, 121, 160, 175, 195, (2), 202, 209, 225, 240, 291, 320, 324, 390, 442, 447, (2), 448, 470, 471.
provisions for the garrison at Gibraltar and 189, 442.
report and representations, by, 82, 317, 371, 419, 429, 447, warrant to, 168.
course of. issues for, 49, 471; new issues for, 6, 12, 91, 92, 126, 202, 251, 325, 407; old, creditors on, 1; issues for, 1, 76, 229, 430.
debenture on, owners of, admitted as shareholders in the South Sea Stock Com pany (as by the Act an Anne, c, 15, cl. 32), 47 note debts of, payment of, 96, 153.
imprests for, account of, required, 175.
issues on the board of, 12, 126, 251, 274, 325, 355, 376, 407, 429, 471.
lands called Lam-hay at Plymouth employed in the service of, 317; lands purchase for, 417.
office, 324; art Port Mahon, 102.
necessary money, issue for, 30.
shorts allowance money, 213, 471. Wages, Book of, 126; arrears of, anonymous information re, 136; issues and payments on the head. of, 3, 12, 30, 32, 38, 79, 91, 92, 109, 116, 126, 183, 202, 216, 222, 235, 242, 251, 257, 281, 312, 325, 345, 355, 367, 376, 386, 407, 431, 441, 462, 470,;and see Navy Seamen. Wear and Tear, issues and payments to the head of, 32, 91, 112, 116,160, 183, 202, 222, 251, 257, 282,313, 355, 367, 386, 407,431, 441, 452, 470. Naylor, Thomas, tides man and boat manat Dover, superannuated, 387. Neagle, Richard, assistant to the Clerkof the Works at Whitehall, 538. Neale(Neal), Francis, Deputy Clerk of the Pipe, 69, 81, 122, 234.
account of the product of Minorca sent to, 144.
assistants, clerks and deputies for, allowance for, 107, 129.
proposals by, for establishing correspondence with Port Mahon via Marseilles, 205. -, Thomas, Master and Worker of the Mint, deceased, surety of (R. Chaplin), 151. Necessary Woman.See Royal House hold Above Stairs and Below Stairs (Board of Greencloth). -, Samuel,a doorkeeper of the kitchen, Royal House hold, 497. Needler, Culverwell, Clerk Assistant to the House of Commons, 454, 527. Needles, The, ship wrecker on, 215. Negus, Francis, Ranger of Bagshot Rails and Sandhurst Walks in Windsor Forest, petition of, 253. Neilson (Neillson), John, 1st lieutenant of Grenadiers in Grants regiment, half pay for, 477. -, Robert, lieutenant in Stewart's regiment, half pay, for 478. Robert Mann, a notorious highway man, 268. -, Samuel, petition for renewal of Exchequer Bills lost, 285. -, Thomas, nominated waiter and searcher at Berwick, 283. Ness(Nesse), co. Lincoln wapentake of, Receiver General of Duties on House s for (J. Harneis), 343. Neston, co. Chester, waiters and searchers at, 113. Netherlands, See Spanish Netherlands; United Provinces. appointed Commissary of the Stores of War and Provisions for the Forces going on the Expedition to Canada under Brigadier John Hill, 71.
appointed to go with Colonel Nicholson to North America, 71, 134, 152.
stores brought back from the Canada Expedition to be sold by, 71, 134. Nevill, (Nevil) -, captain his letter concerning the overcrowding of a transport, 138; letter to 217, Cp. Newell, colonel. -, -, Colonel letter from mentioned, 14; prisoners in Spain to be sent home by, 14. -, Mrs. issue to, 42. Sophia, pensioner on the Civil List, 543. Collectors of Customs at (John Huffam, John Norwood), 244, 283. Deputy (Lieutenant) Governor of, See Hamilton, Walter. sufferers by the French invasion of, debenture of: Acts 9 Anne, c. 16, cl. 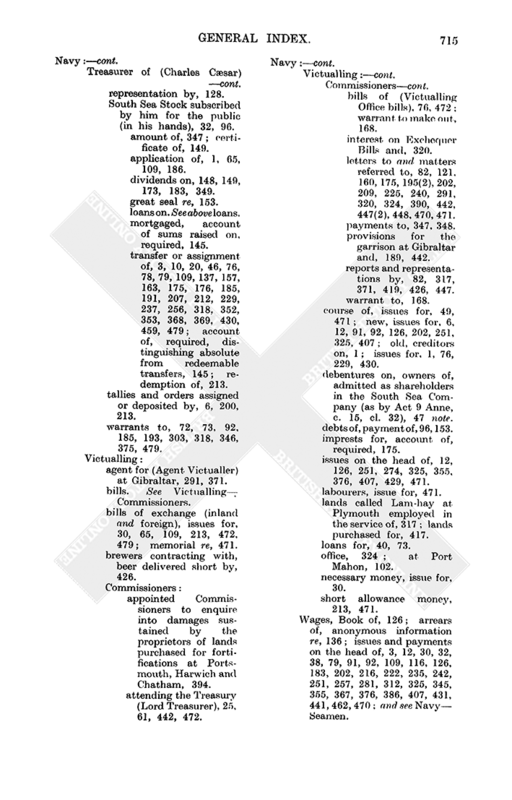 88, and 10 Anne, c. 41, relating to, 399, 401, 408, 473.
as to allowing subscription, of into the South Sea Company, cases and petitions, 399, 400; referred to the Commissioners of Trade, Law Officers and South Sea Company, 399, 400, 401, 408, 414, 461, 471, 473; reports on, 399, 400, 471, 474.
interest on, petition for, 400; to be computed (as by Act 10 Anne, c. 41 ), 473.
warrant for a Great Seal to admit, into stock of the South Sea Company, 473, 474. New College. See St. Andrew's University. Governor of, bills drawn by, petition of merchants for payment of, 147. H.M. ships in, 135; bills drawn by commanders of, 136, 373, 412; contractor for supplying money to (Mr. Edmonds), 227.
importation of rum, sugar and molasses from Surinam to, memorial re, 418.
minister in, annual bounty for, 537.
provisions from, for the garrison at Placentia, 225.
serjeants sent to, with lieutenants Commissions, wives of, memorial of, 389, 390; payments to, 270.
tract of land between Nova Scotia and, petition by disbanded Officers and solidiers for grant of, 237. voyage to, 215. New Forest: Division. See Hampshire. estovers out of petition re mentioned, 135.
fences in, repair of, 390. French wines smuggled in, seizure of, 346. Mrs. Kingdom's lodge and pound in, petition for repair of, 379. New Park Lodge in, Ranger of (Theodosia Kingdom), 169.
officers and keepers of, payment to 230. Pound for Strays in, keeper of (Theodosia Kingdom), 169. Ranger of (Robert Clark ), 256. Riding Searcher for the Customs in, petition for place of, 256.
timber (tress in): Act [9 Wm. III, c. 33] for preservation of, 31.
dotard and decayed, felling and sale of, 229, 230.
for the Navy, enclosure of (by Act 9 Wm. III, c. 33), 221.
for repair of stables at Lindhurst, 341, 389.
wates in, complaint of, 135. Warden (Lord Warden) of (Duke of Beaufort), 230; payment to, 341; representation from, 390.
woodword of (James Worsley), 229, 389, 393. New Hampshire, province of, revenue of, account of, mentioned 135. New Lodge walk in Waltham Forset, q.v. New Park. Lodge in New Forest, q.v. New River water, collector for [Post Office] (Ja,Sarjeant), 452; for St. James's Palace and Stables, payment for, 338. New Romney, co. Kent, riding officers at 239. New Years's Gifts, ambassadorial, See Ambassadorsextraordinaries; in the Post Office, See Post Ofice. Admiralty Court in case, 140. [artillery train for] proposed establishment, 121. 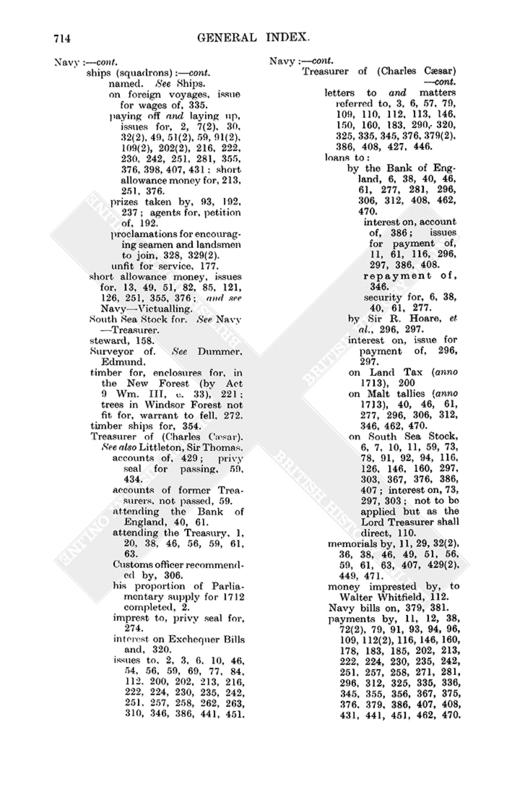 Assembly of, revenues (monies) raised and granted by, appropriated to uses to the perjudice for her Majesty's government, 464; for support of the government, refusal to renew, 464; warrants by, 299. Attorney General of (John Rayner) 33, 77, 473, 539. bills of exchange drawn from, issue for paying, 91.
captain General and Governor in Cheif of. See Hunter Robert; Hyde, Edward, Earl of Clarendon, Lovelace John, Lord Lovelace. Collector and Receiver of Customs in. See Byerley, Thomas. distracted state of the province, 124. H.M. ships at and from, bills drawn by commanders of, 136, 373, 412; contractor for supplying money for, 227.
money current in, difference in value of, from sterling money, surplusage by, 464. Palatines in, payments to, 299, 464.
quit rents in, amount of, 464; used for maintenance of the Government, 464.
revenue of, proposal by the Commissioners for Trade and Plantations for raising, by Act of Parliament, 464. New battle (Newbottle), co. Midlothian, lordship of, fen and blench dutie of, 129. Newberry, Cecilia, rayal bounty for, 271, 472.
coal merchants of, petition for the adjustment of coal measures, 364.
coal trade of, grows wholly useless by the method of ascertaining the measure, of coalsas appointed by the Act for the Admeasurement of keels [30 Car. II, c. 8]. 254.
coastwaiters at, salary of, 254; struck off the establishment, 254.
cod and ling exported from, 182.
land waiters at, 266; for inspecting the coal trade, 254.
ships for and of, 340, 488. New castle, Duchess of (Duchess of New castle's plate at Nottingham), 468. -, Duchess Dowager of, See Cavendish, Margaret. -, Duke of, See Holles John. Newcomen (Newcommen), Lady, pensioner on the Civil List, 543. -, Beverly, captain in Mountjoy's regiment, half pay for 478. Newell, -, colonel, his letter re overcrowding a transport, 136. Cp. Nevill, -, captain. Newell (Newells), George a security for George Dixon, 108, 223; estate of, assignee of (James Taylour), 108; extent against, 108, 223; failure of, 224. -, Josep, security for George Dixcon, 233, extent against, 223; failure of, 224. Governor and Commander in Cheif See Nicholson, Francis. Surveyor of the Coast of (William Taverner), 308.
trade of, designs for the safety of, 215.
trade and fishery in, colonel Nicholson's enquiries re, 156.
yielded by the late treaty with France, 308. Newhaven, co. Sussex, Collectors of. See Pollington, E.; Shoobridge, A.; tidesmen of, 283. New heaven, Viscount of. See Cheyne, William. Newington, Thomas, Supervisor (Surveyor) of the Duties on Houses,appointed Surveyor of Duties on Houses for co. Middlesex, 410; petition of, 391, 404. Newland, James permit to reduce imported brandy and rum to proof, 397. Newman, -, daughter of, petitioner, 412; services of, 412. -, Elizabeth, royal bounty for, 271, 472. -, John, nephew of T. Pennington, 399. -, Richard, master of the Three Pilgrims, 106. Stephen, master of the William, and Elizabeth, 221. Clerk of the Works at (F. Buckle), 538.
horse races at, gold cup for, 145; Queeen plates (Stakes) for, subscriptions for, 468(2), 469. Housekeeper at. See Royal HouseholdAbove Stairs (Housekeepers). Queen's Stud at. See Royal Mews and StablesStud. running horses (Queen running horses) at, bill for keeping, 468; keeper of See Frampton, Tregonnell. school, annual bounty for, 537. Newport, Francis 1st Earl of Bradford, Cofferer of the Household of Wm. III, 480; fee farm rent out of the Great and Little Parks of Brigstock granted to, 187, 194; payments to his executors, 480. 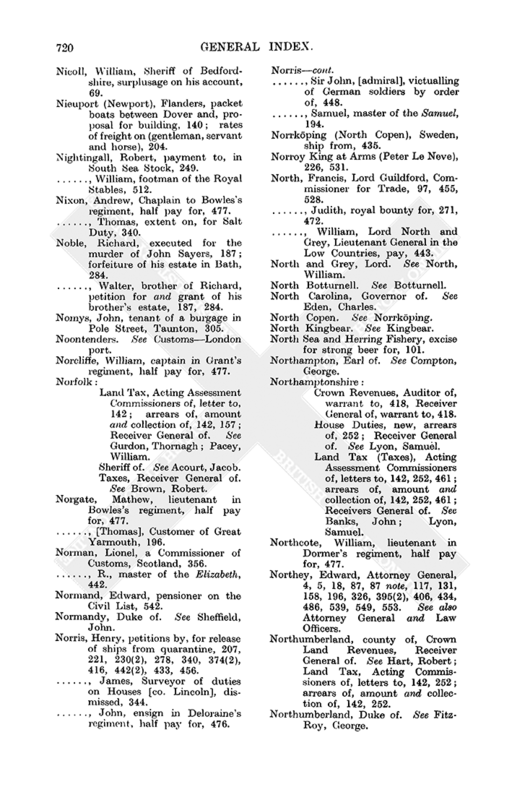 Newsham, Thomas, Receiver General for co. Warwick, petition for expenses 449. -, William, Receiver General of Land Tax for co. Warwick, commission and securities, 231. Newspapers, for the Post Office, payment for, 452. Newsted, John, appointed Surveyor of Duties on Houses [for co. Lincoln], 344. Newton, Dr. Henry, Envoy Extraordianry tot he Great Duke of Tuscany, 451, 519, 551. -, Hugh, tidesman at Weymouth, supernnuated, 265. -, Isaac master and Skelton Castle, 312.
coinage of copper farthings and half pence and, 29.
evidence of, re, weight of bags of silver money, 14.
fees on Coinage Duty money and, 336.
issues to, 53, 274, 360, 392.
matters referred to, 147, 432.
gift from the Queen to, 369. payment to, for losses, services and sufferings, 269. regiment of: bounty for non commisioned officers and private of, 311.
paymaster to, accounts of 369. -, Richard, master of the Gosport Merchant, 105. Nichils, clerk of. See Exchequer Court. Nicholas, Mr., appointed a Commissioner for the intended Lottery, 378. -, Edward, Commissioner for execusing the Office of Keeper of the of the Privy Seal 78, 264, 335, 412; Treasurer and Paymaster of her Majesty's pensioners, 54, 55, 57, 58, 59, 62, 64, 65, 312, 350, 352, 369, 375, 381, 388, 390, 392, 395, 401, 415, 417, 418, 422, 426, 434, 444, 460, 461, 463, 465, 467, 469, 472, 479, 483, 484, 486(2); appointment and salary, 312; letter to 461. -, Oliver, royal bounty for, 355. Nicholls, Thomas, application to be an extraordinary tidesman, London, port, 361. -, Francis Colonel afterwards General, Governor and Commander in Cheif of Nova Scotia and Annapolis Royal; General of her Majesty's Forces in Newfoundlands; Commissioner to enquire into certain matters in North America (viz., accounts of Naval Stores bought by captains of H.M ships; Admiralty Rights and Perquisites; arrears of Prizes; management for revenues; trade and fishery of Newfoundland), 438.
allowance for, 129, 137, 308. assistance for, consideration of, 94.
captain Wade of the Adventure to assist, 150.
his instructions, 6, 94, 110, 141, 142, 148, 156, 308.
letters to, 94, 282; mentioned, 286. Mr. Netmaker to accompany, 152. Nicoll, William, Sheriff of Bedfordshire, surplusage on his account, 69. Nieuport (Newport), Flanders, packet boats between Dover and, proposal for building, 140; rates of freight on (gentleman, servant and horse), 204. Nightingall, Robert, payment to, in South Sea Stock, 249. -, William, footman of the Royal Stables, 512. Nixon, Andrew, Chaplain to Bowles's regiment, half pay for, 477. -, Thomas, extent on, for Salt Duty, 340. Noble, Richard, executed for the murder of John Sayers, 187; forfeiture of his estate in Bath, 284. -, Walter, brother of Richard, petition for and grant of his brother's estate, 187, 284. Nomys, John, tenant of a burgage in Pole Street, Taunton, 305. Norcliffe, William, captain in Grants regiment, half pay for, 477. Land Tax, Acting Assessment Commissioners of, letter to, 142; arrears of, amount and collection of, 142, 157; Receiver General of. See Gurdon, Thornagh; Pacey, William. Norgate, Mathew, lieutenant in Bowless regiment, half pay for, 477. -, [Thomas], Customer of Great Yarmouth, 196. Norman, Lionel, a Commissioner of Customs, Scotland, 356. -, R., master of the Elizabeth, 442. Normand, Edward, pensioner on the Civil List, 542. Normandy, Duke of. See Sheffield, John. 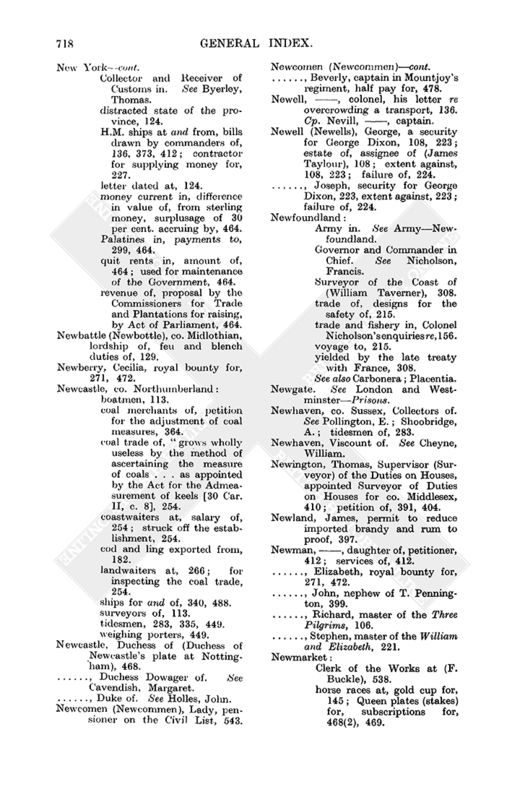 Norris, Henry, petitions by, for release of ships from quarantine, 207, 221, 230(2), 278, 340, 374(2), 416, 442(2), 433, 456. -, James, Surveyor of duties on Houses [co. Lincoln], dismissed, 344. -, John, ensign in Deloraines regiment, half pay for, 476. -, Sir John, [admiral], victualling of German soldiers by order of, 448. -, Samuel, master of the Samuel, 194. Norrkoping (North Copen), Sweden, ship from, 435. Norroy King at Arms (Peter Le Neve), 226, 531. North, Francis, Lord Guildford, Commissioner for Trade, 97, 455, 528. -, Judith, royal bounty for, 271, 472. -, William, Lord North and Grey, Lieutenant General in the Low Countries, pay, 443. North and Grey, Lord. See North, William. North Carolina, Governor of. See Eden, Charles. North Sea and Herring Fishery, excise for strong beer for, 101. Northampton, Earl of. See Compton, George. Crown Revenues, Auditor of, warrant to, 418, Receiver General of, warrant to, 418. House Duties, new, arrears of, 252; Receiver General of. See Lyon, Samuel. Land Tax (Taxe), Acting Assessment Commissioners of, letters to, 142, 252, 461; arrears of, amount and collection of, 142, 252, 461; Receivers General of. See Banks, John; Lyon, Samuel. Northcote, William, lieutenant in Dormer's regiment, half pay for, 477. Northey, Edward, Attorney General, 4, 5, 18, 87, note, 117, 131, 158, 196, 326, 395(2), 406, 434, 486, 539, 549, 553. See also Attorney General and Law Officers. Northumberland, county of, Crown Land Revenues, Receiver General of. See Hart, Robert; Land Tax, Acting Commissioners of, letters to, 142, 252; arrears of, amount and collection of, 142, 252. Northumberland, Duke of. See FitzRoy, George. Norton, Ambrose, Surveyor of the Royal Mems and Stables, 77, 210, 511. -, John, outlaw, in custodiam lease of his estate in Rothwell, 193. -, Margaret, royal bounty in Scotland for, 322. -, [Richard], Warden of South Bere Forest, his complaint against trespassers, 224. Norton Woods in Whittlewood Forest, q.v. Norway, ship for, 218; tobacco exported to, 198. Norwich, co. Norfolk, Land Tax, Receiver General of. See Gurdon, Thornagh; sheriffs of. See Gobbet, George; Shardlowe, Henry. Norwood, Dr. Cornelius, surety for John, petition of, 244. -, John, brother of Dr. Cornelius, Collector of Customs at Nevis, failure and dismissal of, 244, 283. Notter, co. Cornwall, lease of, 137. Nottingham, co. Nottingham, highway robbery at, 268; horse races at (Duchess of Newcastles plate, Queen's plates), 468, 469. Nottingham, Earl of. See Finch, Daniel. Nottinghamshire, Receiver General of Land Tax for. See Bury, John. Nova Scotia, Governor and Commander in Chief of. See Nicholson, Francis; tract of land between New England and, petition of disbanded officers and soldiers for grant of, 237; and see Annapolis Royal. Nucila, John Peter, minister of the Dutch Chapel at St. James's, 532. Nun, William, master of the Success, 231. Nuns, indicted and outlawed, 55, 399. Nutt, John, payment to, for Gazettes and newspapers, 452. Nuttin, William, Groom of the Royal Stables, 512. Nykoping, Sweden, ships from, 359, 442. O. S., letter signed, offering to discover frauds in one of H.M. ships, 406, 408. Oadham (Odam), Catesby. petition for place of Assay Master of the Mint, 173, 324. Oak board and plank, importation of, 343, 374. Oakeover, Sarah, pensioner on the Civil List, 545. Oates (Oats), Matthew, master of the Two Brothers, 278. -, Rebecca, pensioner on the Civil List, 547. Oats, for expeditions, 103, 104, 106; for the Queen's Stud, 72, 148, 163, 275. O'Carroll (Carroll), Sir Daniel, his regiment of Dragoons: case of, 460.
officers of, money due from, for subsistence, petition for, 336; Protestant, petition for half pay, 141; Subaltern, petition for provision, 146.
reduction of, date of, 402. Odams, Joshua, Receiver of Contributions to the Classis Lottery for 1,800,000l. (anno 1712), 377. Officers at Arms, Ireland, new liveries for, 92. Ofranville, Martha D', payment to, 553. Ogilvie, David, payment to, out of Army clearings, 98. -, James, Earl of Findlater and Earl of Seafield, Chancellor and Keeper of the Great Seal of Scotland, pension of, 350; salary, 355. Ogle, Samuel, Commissioner of Excise and one of the Chief Commissioners and Governors of the Revenue in Ireland, 91. Oglethorpe, Richard, Crown evidence sent from Antigua to prove the rebellion there and the murder of Colonel Parke, 54, 261, 276, 314, 360. 384(2), 398, 399, 436(2). O'Hara, Sir Charles, Lord Tyrawley, payment to, in South Sea Stock and tallies, 248; regiment of, sick and wounded men from, in Hospital at Port Mahon, charge for keeping, 289. Oldham, Henry, appointed boatman at Beachley, 192. Oldner, John, Clerk in the Admiralty, 316. Oldys (Oldes),. Sir William, Gentleman Usher Daily Waiter and Black Rod, 455, 503, 525. Olford, Marmaduke, Yeoman of the Chapel, 506. Oliphant of Langtoun, James, First Underkeeper of her Majestys Wardrobes in Scotland, appointment and fee, 450. Oliver, Edward, Bachelor of Divinity, Sub-Almoner, appointment and allowance, 274. Ongley (Onglegsy), Samuel, loan by, on the credit of South Sea Stock, 73; issue to redeem, 213; payment of interest on, 297. -, Sir Sam, carpenter of a fourth rate ship recommended by, 51. Onslow, Thomas, recommendation by, 388, 399. Orange, Pierre L'. See L'Orange. Ord (Orde), Henry, tidesman and boatman at Whitby appointed waiter and searcher at Burnham, 114(2). -, John, appointed tidesman and boatman at Whitby, 114.
appointed Commissioners to enquire into damages sustained by proprietors of lands purchased for fortifications at Portsmouth, Chatham and Harwich, 394.
arrears due to, 471, 547.
attending the Treasury, 1, 13, 63.
barracks in the Tower to be fitted up by, 164.
bill of exchange drawn on, 99.
establishment for Artillery Trains proposed by, 121.
letter from, 424; mentioned, 132, 394.
letter to andmatters referred to, 63, 86, 99, 134, 155, 164, 175, 184, 198, 190, 206, 218, 298, 316, 354, 383, 396, 410, 411, 443, 445, 473.
recall of officers of Artillery Tranis proposed by, 21, 23, 160.
repair of the banks of the river Humber and, 447.
reports by, 432, 446, 456.
salaries of, issue for, 34, 101; repayment of Land Tax assessments on, 383. Clerk of, patent fee, 101, 548; and see Musgrave, Christopher. Clerk of the Deliveries (James Craggs, Newdigate Owsley), patent fee, 102, 548.
debentures, owners of, admitted as shareholders in the South Sea Company, 47 note. 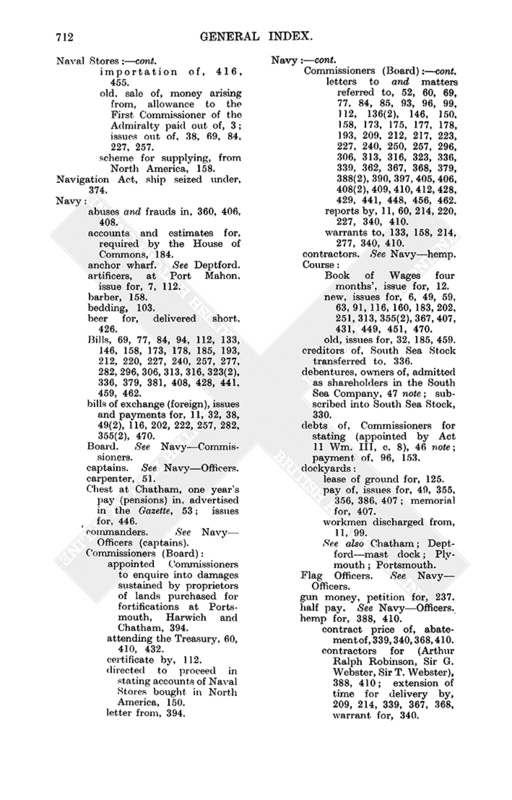 debts of, payment of, 96, 153.
gunners and matrosses of, 189, 190, 423.
gunpowder for, proposal for supplying, 443.
issues for.SeeOrdnance Treasurer and Paymaster. Keeper of the Stores of Small Arms (Thomas Gardner), patent fee, 101, 548. Land Services, issues for, 10, 31, 96, 112, 179, 202, 217, 229, 256, 383, 458; Parliamentary supply for, estimate for, required, 14, 134. Lieutenant General of (Thomas Erle, John Hill), patent fee, 101, 547.
loan by the Bank of England for, 48. Master General of (Duke of Marlborough), 101. Master Gunner of Great Britain (James Pendlebury) 37, 548.
money demanded by, for Guards to be lodged in the Savoy, 184.
anno1711, 589, 839l. 17s. 4d. to make good deficiency of, issues out of, 10, 31, 96, 112, 180, 202, 217.
anno1712 (116,411l. 17s.1d.) payments out of, 229, 256. And seeOrdnanceLand Service; Sea Service. salpetre for, proposal for supplying, 443. Sea Servicc, issues for, 36, 96, 243, 453; Parliamentary Supply for, estimate for 1713 required, 14, 134. Storekeeper of (Edward Ashe, Robert Lowther, Dixie Windsor), fee of, 101, 548. Stores, Commissary of, at Lisbon (Francis Yonge), 184; for Virginia, 206, 218. Surveyour (Surveyor General) of (William Brydges), payment to, on his patent fee, 37, 243, 548.
issues to, 31, 36, 112, 179 201, 217, 229, 243, 256, 383, 413, 453, 458.
letters to, 150, 152, 320.
money for purchasing lands for fortifications in his hands, 316. Payments by, 96, 179, 202, 229, 256. South Sea Stock in his hands, account of, required, 298; dividends on, 148, 149, 349; not to be disposed of, 150; transferred and mortgaged, 145.
tallies in his hands, account of, required, 19, 152, 155, 298; loan on, 48, 49; not to be disposed of, 152. And seeMordaunt, Harry. Orford, co. Suffolk, Customs Officers at, letter re, mentioned, 131; tidesmen and boatmen at, 283(2). Organ blower. See Chapel Royal. Orkney, Countess of. See Hamilton, Elizabeth. -, Earl of. See Hamilton, George. Orkney and Shetland (Zetland) Islands, hawks from, 450; Queen's Chamberlains and vassals in, fees, etc., paid by, 449. Orleton (Orlton), Hugh, Deputy Inspector of prosecutions in the Exchequer for uncustomed and prohibited goods, 462; appointment, 239. Orme, Samuel, tailor in the Great Wardrobe, 533. Ormonde, Duchess of. See Butler, Mary. -, Duke of. See Butler, James. Orrery, Earl of. See Boyle, Charles. Osborne (Osbourn), Charles, pensioner on the Civil List, 547(2). -, John, tidesman and boatman at Falmouth, superannuated, 282. -, John, surety of Robert Brown, petitioner, 261.
grant pf andgrant of administration of Charles Mallet's personal estate to, 89, 165. Marine Regiment commanded by, 294. -, Samuel, et al., petition of, re their loss on conveying tin from Cornwall to London, 462, 463. -, Thomas, Duke of Leeds, administrator of the personal estate of Charles Mallet, 89, 165. Osman, Hagi, merchant of Smyran, petitioner, 93. Ossulston, Lord. See Bennet, Charles and John. packet boats to, 140, 204, 261, 434. Oswald, Dr. George, son and heir of Sir James, petitioner, 458, 459. -, Sir James, deceased, tackman of Excise in Scotland, debts of, 458, 459. Otway, Frances, pensioner on the Civil List, 544. Oughton, -, colonel, issue to, 41. Oulder, Wiliam, master of the Oriana, 105. Ourique (Ovrique, Ovrigne), Campo de, Portugal. SeeCampo de Ourique. in civil actions, memorial re goods and chattels taken upon, expressing the tediousness of the course and proposing a remedy, 264.
of professed nuns, 55, 399. Outlaws, estates of, in custodiamlease of, 71, 154, 193, 270. Owen, -, ensign in Wittewrongs regiment, half pay for, 211. -, Hugh, lieutenant colonel (colonel), royal bounty for, 65, 479; in Wittewrong's regiment, half pay for, 211. -, John, Comptroller of the warhouse for prohibited East India goods, dismissed, 343. -, John, brother of Thomas, a Customs Officer, distracted, 361. -, John, captain in Wade's regiment, half pay for, 478. -, Kettleby, appointed coastwaiter, London port, 449. -, Meyrick, second lieutenant in Wittewrong's regiment, half pay for, 211. -, Mihael, captain in Pearce's dragoons, half pay for, 475; recompense for loss of his hand, 395. -, Robert, deputy comptroller, waiter and searcher at Aberdovey, appointed collector, waiter and searcher there, 114. -, Thomas, letter from, mentioned, 361. 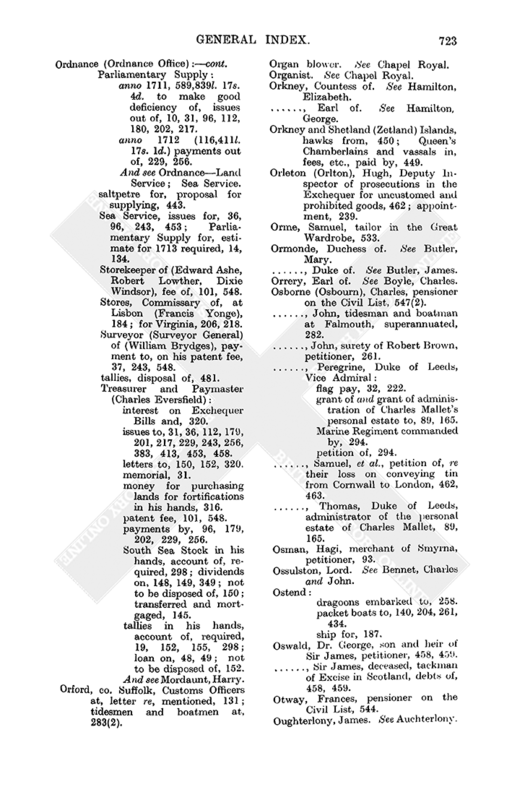 -, William, tidesman in the inferior list, London port, deceased, 113. Owsley, Newdigate, Clerk of the Deliveries, Ordnance, 548. Oxford, Earl of SeeHarley, Robert. Doctor and Professor of Civil Law (T. Boucher), 530. Lady Margaret Divinity Leeture, perpetuity for, 529, 530.
preahcer at, perpetuity for, 529. Professor and Reader of Physic (Dr. Thomas Hay), salary, 530. Receiver General of Land Tax. SeeHarrison, Sir Robert. 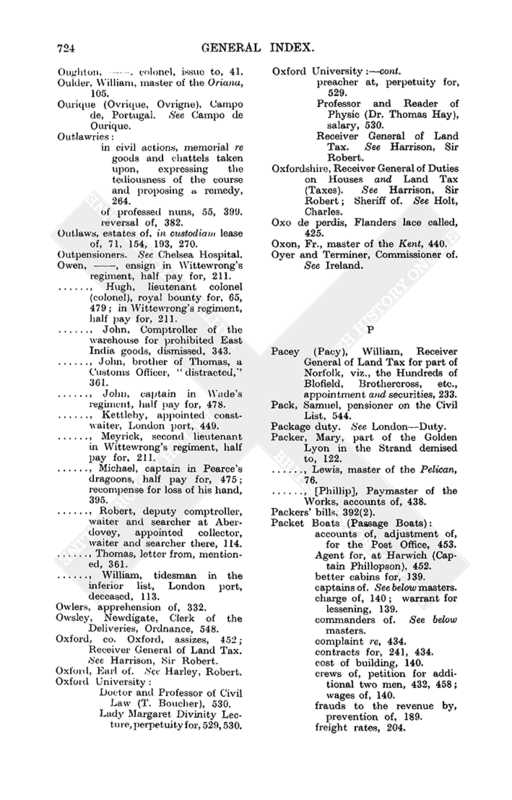 Oxfordshire, Receiver General of Duties on Houses andLand Tax (Taxes). SeeHarrison, Sir Robert; Sheriff of. SeeHolt, Charles. Oxo de perdis, Flanders lace called, 425. Oxon, Fr., master of the Kent, 440. Oyer and Terminer, Commissioner of.